SEATTLE, Washington, March 24, 2014 (ENS) – The death toll from a sudden landslide north of Seattle Saturday rose to 14 with the discovery of six bodies today, Snohomish County Emergency Management Director John Pennington told reporters. The slide covers about a square mile, affecting the village of Oso, with a population of about 180, and Darrington, a town of about 1,350. The number of people unaccounted for now stands at 176. Governor Jay Inslee said he received assurance from the Federal Emergency Management Agency, FEMA, this morning that the federal government will issue a limited emergency declaration for direct federal assistance in the response to the Oso mudslide. FEMA Regional Administrator Kenneth Murphy told the governor in a phone call that he was providing a “verbal emergency declaration” that will allow for immediate federal assistance. The U.S. Geological Survey says recent rain conditions and soil saturation led to the onset of the landslide at about 11:00 am local time. Landslide debris covered about 30 houses and 0.8 miles of State Route 530. The slide has dammed and partially blocked the North Fork Stillaguamish River, creating a potential for flooding at the blockage. A pool of water is forming behind the natural dam, also creating a flood hazard downstream if the natural dam is breached. Currently, the pool is 20-30 feet deep. USGS scientists, supporting federal, state and county responders, say the hazard is not yet over as future rain conditions or snowmelt from nearby mountain tops could make the situation worse. Current research is focused on gathering more LiDAR imagery and aerial photographs to help with mapping the extent of the slide. The USGS is working with the National Weather Service on preliminary modeling of possible scenarios of what would happen if the blockage on the Stillaguamish River were to break. The models will help estimate the range of potential discharge from the pool that has formed behind the landslide. From this data, National Weather Service scientists will develop flood inundation maps to estimate where flooding could be most likely to occur. Other large, sudden landslides have occurred in this valley, the USGS says. 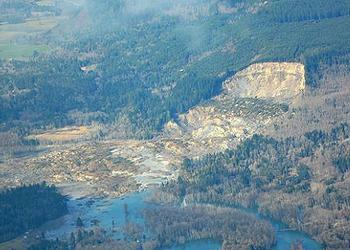 Large landslides are the norm in many parts of the western foothills of the North Cascades. The agency says that in the Nooksack Valley in Whatcom County, from the town of Glacier downstream, there have been at least five large catastrophic landslides in the last 12,000 years. The USGS says landslides occur in all 50 states and U.S. territories, and cause $1-2 billion in damages and more than 25 fatalities on average each year. RICHLAND, Washington, March 24, 2014 (ENS) – The federal government must begin removing radioactive liquid waste from a leaking double-shell tank at Hanford Nuclear Reservation no later than September 1, under an Administrative Order issued today by the Washington State Department of Ecology. The order requires pumping to begin about 18 months sooner than what the U.S. Department of Energy, DOE, proposed in its revised pumping plan provided to the state on March 7. Tank AY-102 was confirmed to be leaking into the tank’s secondary containment in October 2012, creating a serious concern about a failure of the critical waste cooling system, and an increased risk of a leak to the environment.. Since then, Ecology has been working with the U.S. Department of Energy and its contractor to determine options for addressing the leaking tank. “In order to meet legal requirements and to provide public health and environmental protection, the state believes this leaking double-shell tank must be addressed in the most aggressive manner possible,” said Ecology Director Maia Bellon. “Waiting another two years, at best, to initiate actions to address this hazardous condition is neither legally acceptable nor environmentally prudent. The state cannot afford further delays on removing waste from this tank,” she said. Located on the Columbia River in south-central Washington, the Hanford site holds two-thirds of the nation’s high-level radioactive waste by volume. Established in 1943 as part of the Manhattan Project in the town of Hanford, the site held the B Reactor, the first full-scale plutonium production reactor in the world. Plutonium manufactured at the site was used in the first nuclear bomb and in the bomb detonated over Nagasaki, Japan that ended World War II in 1945. During the Cold War, the project was expanded to include nine nuclear reactors and five large plutonium processing complexes, which produced plutonium for most of the more than 60,000 weapons in the U.S. nuclear arsenal. Many early safety procedures and waste disposal practices were inadequate, and government documents confir that Hanford’s operations released radioactive materials into the air and the Columbia River, which continue to threaten the health of residents and ecosystems. Today, Hanford is the most contaminated nuclear site in the United States. As of 2013, there were 177 radioactive waste storage tanks on-site, and 149 of them have but a single shell. The contents of double-walled tank AY-102, about 850,000 gallons of liquid and sludge, are high in radioactivity and require cooling to control waste temperatures, says the state agency. The state’s order directs the DOE to submit a report to Ecology within 90 days that evaluates the integrity of the secondary containment system, including the impacts of the waste currently in the annulus – the space between the primary and secondary containment structures. The federal agency’s contractor must take monthly samples of liquid from the tank’s leak detection pit to address potential leaks to the environment. The DOE must conduct weekly video inspections of leaks and monthly video inspections of the annulus. Removal of the radioactive sludge must begin no later than December 1, 2015 and enough waste must be removed by December 1, 2016 to allow for an inspection to determine the cause of the leak. Failure to comply with the order could result in fines for the federal government. WASHINGTON, DC, March 24, 2014 (ENS) – The U.S. Supreme Court today declined the coal mining industry’s request to hear a case against the U.S. Environmental Protection Agency, which disallowed part of a permit for a West Virginia mountaintop removal coal mine, the Spruce No. 1 mine. In October 1999, the Spruce No. 1 Mine became the subject of the first significant federal court decision on mountaintop removal mining, won by individual community members and the West Virginia Highlands Conservancy. That case, in which the late Judge Charles Haden found that the Army Corps of Engineers’ permit for the mine was unlawful, touched off years of controversy and litigation over this proposed mine. In the meantime, scientific evidence showed how devastating mountaintop removal mining is for local waters and communities. The case declined by the Supreme Court today stemmed from a January 2011 decision of the EPA to rescind the U.S. Army Corps of Engineers’ approval for Arch Coal to dump waste rock and dirt into 6.6 miles of Pigeonroost Branch, Oldhouse Branch and their tributaries. The EPA cited scientific evidence that mountaintop removal mining damages water quality downstream. The agency pointed to an independent engineering study that found Arch Coal could have reduced the environmental impacts of the Spruce No. 1 mine. The EPA said it would allow mining to continue on another portion of the site, which would bury about a mile of streams in the Seng Camp Creek watershed, because work there had started. Arch Coal’s Mingo Logan subsidiary appealed the EPA decision. In a March 2012 ruling, U.S. District Judge Amy Berman Jackson sided with the company. In April 2013, the U.S. Court of Appeals for the District of Columbia backed the U.S. EPA and overruled Judge Jackson’s decision that the EPA lacked the legal authority to rescind the Clean Water Act permit the Corps had approved for the mine. By declining to take the case, the Supreme Court refused to reverse the appellate court’s ruling that EPA has full authority to protect clean water whenever necessary to prevent unacceptable environmental harm. “The Clean Water Act, enacted with wide bipartisan and public support, gave EPA broad authority to step in and stop this type of wholesale destruction and pollution of U.S. waters,” said Van Noppen. “The Supreme Court refusal to hear industry’s baseless case confirms that the EPA has the clear legal authority to prevent the dumping of waste whenever it would cause unacceptable harm to communities and the environment,” he said. Jim Hecker is environmental enforcement director at Public Justice and served as co-counsel in the 1998 case that initially blocked the Spruce mine. “The coal industry has falsely painted the Spruce mine veto as an example of EPA overreach and a ‘war on coal,’ when in fact EPA’s authority to veto this permit is obvious from the face of the statute, and EPA’s decision is based on clear scientific evidence of serious environmental harm from mining,” said Hecker. WASHINGTON, DC, March 24, 2014 (ENS) – Conservation and food safety groups today filed a formal notice of intent to sue the U.S. Environmental Protection Agency for failing to protect hundreds of endangered fish, butterflies and other species from a new pesticide with the tongue-twisting name of cyantraniliprole. The notice, filed by Center for Biological Diversity, Center for Food Safety and Defenders of Wildlife, claims the EPA violated the Endangered Species Act by approving the widespread agricultural and residential use of the new pesticide in January without input from the U.S. Fish and Wildlife Service and National Marine Fisheries Service. The groups claim the EPA failed to consider or mitigate impacts to endangered species, despite concluding in its assessment that cyantraniliprole is “very highly toxic” to hundreds of endangered aquatic species such as freshwater fish, mussels and clams, as well as 20 species of endangered butterflies. “Once again the EPA has approved a harmful pesticide without adequate conservation measures to protect endangered species,” said Brett Hartl, endangered species policy director at the Center for Biological Diversity. “This reckless approval of cyantraniliprole really undermines recent efforts to reform the EPA’s dangerous policy of ignoring the disastrous effects pesticides are having on wildlife across the country,” he said. Cyantraniliprole is a systemic insecticide that works by impairing the regulation of muscle contractions causing paralysis and eventual death in insects. EPA has registered cyantraniliprole as a seed treatment although it is considered “highly toxic on acute and oral contact basis” for bees, which have suffered devastating declines in the past decade. EPA is aware that pesticide-treated seeds threaten foraging bees, which are exposed to contaminated dust plumes during planting. EPA notes that cyantraniliprole also alters the stability of the thyroid as tested on laboratory rats as a result of enhanced metabolism of the thyroid hormones by the liver. The EPA approved the pesticide despite recent collaborative efforts on the part of the EPA and the two federal wildlife agencies, in response to a report from the National Academy of Sciences, to improve their procedures for evaluating the impacts of pesticides on endangered species before they approve those chemicals for general use. Right now hundreds of pesticides that negatively affect endangered species are in widespread use without ever having undergone an Endangered Species Act review. BALTIMORE, Maryland, March 24, 2014 (ENS) – Advancing the next generation of tidal energy, global security and aerospace company Lockheed Martin has begun a contract for tidal energy company Atlantis Resources Ltd. to optimize the design of Atlantis’ new 1.5-megawatt tidal turbine, the AR1500. Designed to operate in highly energetic tidal locations, the AR1500 turbine is one of the largest single rotor turbines ever developed. The increased capability and integrated, advanced functionality will help bring commercial tidal energy to reality. Initially, the new tidal turbine will support the world’s largest tidal stream project under development – the MeyGen project in Scotland’s Pentland Firth. Once completed, the MeyGen project is expected to deliver up to 398 megawatts of power, enough energy to power 200,000 homes. The MeyGen project will contribute to Scotland’s goal of 100 percent renewable energy by 2020. “With us acquiring the MeyGen project, and receiving full consents to begin construction of the project’s first phase, it has been an amazing 12 months of growth for Atlantis,” said Tim Cornelius, chief executive officer of Atlantis Resources, a turbine supplier and project developer of tidal energy systems. A tidal turbine works like an underwater wind turbine. The tides’ ebb and flow force the blades to spin, which rotate the turbine and activate a generator that produces electricity. Tidal energy generation is almost entirely independent of the weather, unlike wind power and solar energy, and the tidal movements can be accurately forecast for years ahead. WASHINGTON, DC, March 24, 2014 (ENS) – At a meeting hosted by the White House Rural Council last week, Agriculture Secretary Tom Vilsack announced plans for a forthcoming prize competition to design and build high-rise wood demonstration projects. The USDA plans to invest up to $1 million to launch the competition. A nonprofit partner, the Binational Softwood Lumber Council, has committed an additional $1 million for the wood high-rise competition. The contest is intended to help spur increased sustainability in construction and will give priority to applicants that source materials from rural domestic manufacturers and domestic, sustainably-managed forests. Vilsack also is creating a new partnership to train architects, engineers and builders to use advanced wood building materials in innovative ways. The new training program will include a $1 million investment from the U.S. Forest Service and will be conducted in partnership with WoodWorks, a nonprofit organization that provides technical support, education, and resources to architects, engineers, and developers for the design of modern wood buildings. Vilsack said these efforts support President Barack Obama’s Climate Action Plan goal of preserving the role of forests in mitigating climate change. Wood may be one of the world’s oldest building materials, but it is now also one of the most advanced, said Vilsack. Building stronger markets for innovative new wood products supports sustainable forestry, helps buffer reduce greenhouse gas emissions, and puts rural America at the forefront of an emerging industry. Presently, the market for wood and other related forest products supports more than one million direct jobs, many in rural America. As these markets expand, so will the economic opportunities, the secretary said. Emerging engineered wood technologies can be used in industrial building projects such as tall buildings and skyscrapers, as well as other projects. By some industry estimates, a three to five story building made from emerging wood technologies has the same emissions control as taking up to 550 cars of the road for one year. Wood-based designs have also been demonstrated to improve energy efficiency, thereby reducing energy consumption for heating and cooling. These announcements were made as part of a workshop hosted by the White House Rural Council called Building With Wood: Jobs and the Environment. It was attended by architects, builders, designers, wood manufactures, foresters, state officials, university leaders and representatives from the USDA, General Services Administration, Department of the Interior, Federal Emergency Management Agency and Department of Defense. They also are part of USDA’s overall strategy to promote the use of wood as a green building material. The USDA’s Forest Products Laboratory in Madison, Wisconsin has invested over $2 million in research and technical support for emerging wood technologies.